It is amazing how the year becomes shorter and shorter as we become older and hopefully, wiser! It is again December and the blessed time of year to send our love and joy out around the world to all our family and friends. We wish you a joyous holiday season and a peaceful and abundant New Year of 2005. For us, 2004 was filled to the brim and overflowing with memorable events! Last Christmas was again spent in Australia at the Mooloolaba Yacht Club near Brisbane on the Queensland coast. We enjoyed showing Australia to our daughter, Julie and her husband Chris for their short visit in November. We visited our special beach at Alexandra Bay near Noosa and spent afternoons on the lovely beach across from the Yacht Club. We also had an exciting time at Steve Irwin's, (The Crocodile Man) Australia Zoo and visited the Queensland Museum in Brisbane. We stopped by to say hello to our friends at the Suncoast Gem and Fossicking Club in Buderim where Eric and David spent many hours cutting opals and faceting gemstones. In January, David and Ellen enjoyed a visit to Melbourne, Victoria sightseeing and attending another Summit University - Downunder with our church, while staying at a lovely historical cottage bed and breakfast in the Dandenoong Mountains. We visited Kathyrn and Mayer Page at their lovely new home and property nearby. They crossed the Pacific with us on *Lady Kathyrn,* completing their circumnavigation upon their arrival back at Gulf Harbour, Auckland, New Zealand in November 2001. Mayer has been battling cancer for many years and we are praying that he has many more years with his wonderful family and friends. He is an inspiration for us all. During January and February, we prepared to head north to Indonesia with boat projects, cleaning, washing, medical and dental appointments, provisioning, etc. On February 21, David and Ellen flew to Maui for a much too short visit seeing friends, looking at our Olowalu property, and making a few improvements on our Napili Point Condominiums. Unfortunately, we never seem to have enough time! On March 6, Ellen and David flew to Denver, Colorado arriving about 10pm on Julie's due date to await the arrival of our grandson! It was obvious that he waited for our arrival since Julie went into labor just a few hours after we had touched down in Denver. Paul Kekoa Johnson was born at 7:18pm Sunday March 7, 2004! He weighed 8 lbs 10.7 oz and was 20 ¾ inches long! It was an amazing experience to be outside the delivery room while he was delivered by Cesarean section. We definitely are relishing our new roles as grandparents and uncles! Julie and Chris are very proud parents! You may view Paul at: www.paulkekoa.com for lots of pictures. We were able to visit with only a few friends while in Evergreen, Denver, and Boulder, since we spent most of our time watching little Paul grow! David spent several days in Rochester, New York visiting his mother and sister in their new home, purchased after the sale of Mom Ernisse's Florida home. Mom Ernisse is doing very well and has almost completely recovered from her medical problems of last year. We are very thankful! David's father remains in an Alzheimer's home in Fort Myers, Florida where he receives excellent care. After returning to Australia on April 1, we finished up the remaining boat projects, (Eric and Jason had accomplished most of them while we were away), did final provisioning, and said many tearful "alohas" to all our many friends in Mooloolaba on April 22 when we headed north to Bundaberg. We spent a few weeks at Bundaberg Port Marina, hauling out, doing boat repairs, selling our car, and provisioning before leaving for Darwin on May 7. We enjoyed cruising the coast of Queensland, especially Cairns and Lizard Island, although we were disappointed not to have time to spend snorkeling on the pristine Ribbon Reefs of the Great Barrier Reef. We sailed across the lumpy bumpy Gulf of Carpenteria arriving in Darwin on July 4. We spent our time at Cullen Bay Marina, where Tauree Hewitt, Eric's friend from Brisbane, visited us from July 14-19. We enjoyed a day at Litchfield Park swimming under beautiful waterfalls and visited the Northern Territory Museum, in between doing boat work, provisioning and preparing to leave for Kupang. On July 24, we left Darwin, Australia with the Kupang Rally of 60 boats to sail to West Timor in Indonesia. We were treated like royalty by the Race Committee after our arrival on July 28. We attended several banquets with delicious Indonesian food and cultural dancing. The dancing was the most interesting and spectacular we have seen anywhere in the world with their stunningly beautiful attire! The Indonesians are a very friendly, helpful and giving people! A smile from us was always greeted by a larger one from them. On our tour, we saw ikat weaving at the King's House in Baum, the Kupang Museum, their beach, and monkeys in their caves. English speaking guides, who were young students at the local university studying English, were very knowledgeable and helpful with local information and history. We sailed over night to Kalabahi, Alor Province on August 2 to attend their cultural festivities. We departed Alor on August 6 to day sail along the north coast of the islands of eastern Indonesia. A definite hi-light was our tour of the Komodo Dragons on Rinja Island. We spent several days between Gili Air, where we snorkeled and Eric actually surfed, and Lombok, where Mohammed took us on a wonderful tour of his island and on an all day shopping trip. We are learning to bargain for almost everything! Through some very tough bargaining, we purchased several exquisite gold pearls which will eventually be made into lovely jewelry similar to Ellen's Tahitian black pearls. We arrived at Lovina Beach on the north coast of Bali on August 30. Unfortunately, the hawkers really "got to us" and we couldn't leave fast enough after an all day driving tour up to Mount Besar. Unfortunately, we did not experience the Bali which we had anticipated, so we were greatly disappointed. We departed Bali on September 5, heading to Kalimantin (Borneo) to travel up the river to visit the orangutans, which was to be another hi-light of this season; however, the oil cooler on our engine failed at Bawaen Island, Java, and we had no other alternative but to sail directly to Nongsa Point Marina on Batam Island, Sumatra, Indonesia, across the Straits from Singapore. Those five days of sailing were the most stressful of all our cruising but thankfully we had enough wind to sail almost the entire way (very unusual for that time of year)! The number of fishing boats and freighters on the radar screen was beyond the normal mind to comprehend or to decipher! The water was full of trash with plastic and nets which could immediately stop your engine or propeller. To add the icing on the cake, there was also a very real threat of piracy in these waters approaching Singapore. We were very tired since we had doubled up our watch schedule! We were immensely relieved and thankful when we arrived at Nongsa Point Marina on September 14, which was also another milestone: we are back in the Northern Hemisphere! We crossed the Equator on September 13, 2004 at 1036 at 00 Degrees 00 105 Degrees 42 East! We were almost halfway around the world from crossing the Equator to the southern hemisphere on February 28, 2001 at 1504 at 00 Degrees 00 81 Degrees 14 West! On Batam Island we took a taxi into town to provision but it was very bleak and not enjoyable. Eric and David took the ferry over to Singapore to pick up the needed part for the engine after it arrived at Raffles Marina so we could safely cross the Singapore Straits, the busiest shipping channel in the world. On September 21 we headed across the straits to Raffles Marina and would have been safely tucked into our slip before noon, if we had not experienced a "sumatra" with strong winds, torrential rains, and lightning. We enjoyed Singapore immensely and were very impressed with the transit system and how easy and safe it was to get around. We enjoyed the food and the shopping certainly does live up to its reputation as a shopping Mecca. The Jurong Bird Park, the Singapore Zoo, and the Orchid Gardens at the Botanical Gardens were all spectacular! We hope to return someday! October 2, we started sailing up the Malacca Straits on day trips and had to be constantly on watch for fishing boats, fish nets, freighters, trash, and pirates. We arrived at Admiral Marina at Port Dickson, Malaysia on October 4, and toured Kuala Lumpur in one day (impossible), visiting the National Mosque, the Islamic Cultural Museum, the Petronas Towers (now the tallest buildings in the world), and enjoying a spectacularly beautiful Cultural Dance Show at the Malaysia Tourist Center. The following day our taxi driver drove us to the historic town of Melaka, where we visited Christ Church, the Sultan's Palace, and roamed around the markets in Chinatown and elsewhere while awaiting the Maritime Museum to open after Friday Prayers (Muslim). During our drive home we enjoyed the beautiful mountainous rural areas with water buffalos and goats, traditional homes, and many mosques in both traditional and Chinese styles. Riding in a taxi is definitely an experience not to be missed in Indonesia, Malaysia and Thailand, and it is best to close your eyes, to remain silent, and to pray to all the angels for a safe arrival! We arrived in Langkawi on October 13, completing our transit up the Malacca Straits, where, thankfully, we encountered no problems. Langkawi is a duty free port in Malaysia with inexpensive liquor, cigarettes, and chocolate. It is also the place to receive boat parts and supplies to avoid paying 100% duty tax in Thailand. On October 17, after checking out of Malaysia for Thailand, we spent the night at the impressive anchorage on Langkawi appropriately named Hole in the Wall, where we were anchored in a jungle river encircled by high cliffs with monkeys along the shore and sea eagles soaring above. We dinghied up the river and entered our first "hong" or cave. We noticed the remains of the light bulbs which had once been installed for tourists to view the bats in this cave between the stalactites and stalagmites. Of course, when they initially turned on the lights, all the bats left along with the tourists. The bats are now slowly returning and we enjoyed our visit. We checked out of Malaysia for Thailand on October 16. En route to Thailand, we spent several days at Butang Island and Rok Nok where we snorkeled in beautiful crystal clear water, our first since Banta Island, Indonesia, so many months ago. Unfortunately, much of the coral has been destroyed by dynamite and very few fish have survived the massive fishing fleets and local fishermen in their "long tail boats" (long wooden boats with an engine on top and a long shaft with the propeller barely in the water behind). We arrived at Ao Chalong Harbour, Phuket, Thailand on October 22 and into a slip in the Yacht Haven Marina on October 24. We checked into Thailand from there by car. It only took four days to complete all our check-in formalities with posting a bond so that the captain (David) could leave the country while the boat remained at the marina! All of this allowed us approximately 28 days in Thailand before having to leave the country to reenter at which time, another 28 days will be given! We were beginning to feel like "Alice in Wonderland!" We arranged our inland travel through Andrea Ross, the daughter of a fellow cruiser whose company, Journeys Within, is a travel agency with a bed and breakfast in Cambodia. We departed Phuket by air on November 1 with Bangkok, Chiang Mai, and Siem Reap (Angkor Wat) Cambodia on our itinerary. In Bangkok we visited the Temple of the Emerald Buddha, the Grand Palace, Wat Pho with the Reclining Buddha and were given a traditional Thai massage at the Temple Massage School, the Royal Barge Museum after a "long tail boat" ride through the Klongs (canals), Wat Arun (Temple of Dawn), Golden Mountain, the flower market, and the floating market. We enjoyed the Bangkok Night Markets while staying at the Hotel Manhattan, feasting on delicious Thai cuisine every night. Our waiter at the hotel, Koisin, and our personal tour guide, Annie, made our Bangkok visit memorable, since we highly value such personal contact when we are traveling. On November 5 we flew to Chiang Mai in northern Thailand, where we were greeted by our guide, Joy. We visited Wat Phathad Doi Suthep, a very sacred Buddhist Temple where our waiter at the Hotel Manhattan had been a monk for four years. Joy was very knowledgeable about Buddhism and we felt extremely blessed to have her for our guide for a few days. We visited wood carving, jade, jewelry, lacquer works, and celadon (unique pottery) handicraft factories. Unfortunately, we always need to spend hours deciding on our special purchases. We enjoyed a traditional dinner and dance show where Joy convinced Eric and Jason to dance with the beautiful Thai dancing girls! The following day was spent at the Lampang Elephant Conservation Center enjoying the show, feeding the elephants, and riding elephants through the hills and waters of the Center! After a free day, shopping at the Night Markets, from our rooms at the Chiang Mai Plaza Hotel, we departed by air on November 8 to Siem Reap (Angkor Wat) in Cambodia. We stayed at the Moon Inn, because Journeys Within B&B was full. We enjoyed visiting with our travel agent, Andrea, before being driven to the Angkor Village Resort for a traditional dinner and dance performance of Apsara or Khmer dancing and Hill Tribes cultural dances and music. We spent the following days visiting various sights at Angkor Wat, Angkor Thom, Banteay Srei, and more with our extremely informative guide, Song. We enjoyed the local Cambodia food, which is as delicious as Thai, but maybe not quite so hot, at many local restaurants. We visited the Land Mine Museum which was heart wrenching. We drove through rural areas, similar to Thailand, but where more people ride bicycles than motorbikes. There were many ponds containing lotus blossoms and water lilies along the road to Tonle Sap Lake, where we boarded a long tail boat to visit the floating village and fish farm. We climbed Phnom Krom for the sunset view over miles and miles of water and rice paddies. We enjoyed a tour of a local village with Ravi, meeting his mother, family and friends, while they celebrated a holy Buddhist Day. We were completely taken with the beautiful gentle people of Cambodia, who all suffered greatly under the Khymer Rouge. Ravi's father was killed, Song, our guide was forced to build a dam at the Lake while eating two teaspoons of rice per day supplemented with ants and grasshoppers, and Naran's (Jason's former girlfriend from Maui) parents were killed, all by the Khymer Rouge. We visited the Puok district silk farm to watch the process of silk weaving and then spent several hours shopping at the old Market. Unfortunately our tour had to come to an end and we departed on November 12 for the short flights back to Phuket and to never-ending boat work. We will have memories to last forever from our experiences in this part of the world - all very positive and rewarding! We spent the following two weeks having the teak refinished in the cockpit, polishing the paint, cleaning, washing, and shopping in between moving from slip to slip in the marina, wherever they had space for us! We had lots of excitement November 25 (Thanksgiving) when all yachts were preparing for typhoon "Muifa" which was predicted to make landfall directly on Phuket that evening. We decided to anchor out to prepare the boat for 40-50+ knots of wind. Thankfully, nothing happened! The last typhoon which struck Phuket fifteen years ago killed 500 people with lots of wind and rain. We enjoyed a very thankful Thanksgiving without turkey and stuffing, but many of you wrote that you enjoyed enough for all of us! Thank you! On November 27, Eric's friend Tauree arrived from Brisbane, and we have been on "holiday" ever since. We sailed to Phang-na Bay and Krabi with their absolutely incredible limestone formations and beautiful green translucent water. Unfortunately, the snorkeling here is just not up to our high standards but it will have to suffice for Tauree's first snorkeling experience. We sailed to and spent time at Phi Phi Don, Koh Rocha Yai, and Nai Harn Bay. At each location we swam, snorkeled, shopped, had massages and enjoyed the wonderful Thai cuisine. Unfortunately, we had to return to Yacht Haven Marina on December 8 to make our visa run to Myanmar (Burma). We blew out the clew on our genoa and had problems with the head board on the main sail in the strong winds, and we could not enter the marina because of the winds and strong current, so we anchored. We left from the boat at 6am to drive to Ranong Customs where we boarded a long tail boat which stopped at both Thai and Myanmar checkpoints before arriving in Myanmar where they finally stamped our passports. We decided to return to Ranong immediately on the same long-tail and were checked back into Thailand by 1:30pm. We had a small lunch at a coffee shop and returned to Yacht Haven Marina by 6:30pm, just as the rains came! We were all tired, especially Eric after driving for eight hours in Thailand. Incidentally, Thailand is absolutely the most dangerous place we have ever driven. There are millions of motorbikes with as many cars and "tuk-tuks" (small buses) all chaotically maneuvering to gain advantage as everyone races from place to place, with complete disregard for routinely accepted logical rules of the road or signal lights! We waited almost an hour before leaving the car and did not get too wet dinghing out to the boat. We are now on the west side of Phuket enjoying the beautiful beaches; but unfortunately, they all seem to be "rolly" anchorages. We are preparing for an early celebration of Christmas Day on December 20 because Tauree is returning to Australia to spend Christmas Day in Melbourne with her family. We have been cooking wonderful Thai food with the help of a new cookbook. Many cruisers have been taking cooking classes which are available everywhere. We will be having our last Ghiradelli brownies as our special Christmas treat this year! We will be in Yacht Haven Marina from Christmas Day until January 6, when we will check out of Thailand beginning our long passages to Sri Lanka, Maldives, Oman, Eritrea, up the Red Sea, to Egypt, Cyprus, and arriving in Turkey approximately June 2005. We will continue across the Mediterranean Sea and the Atlantic Ocean to the Caribbean arriving in January 2006. 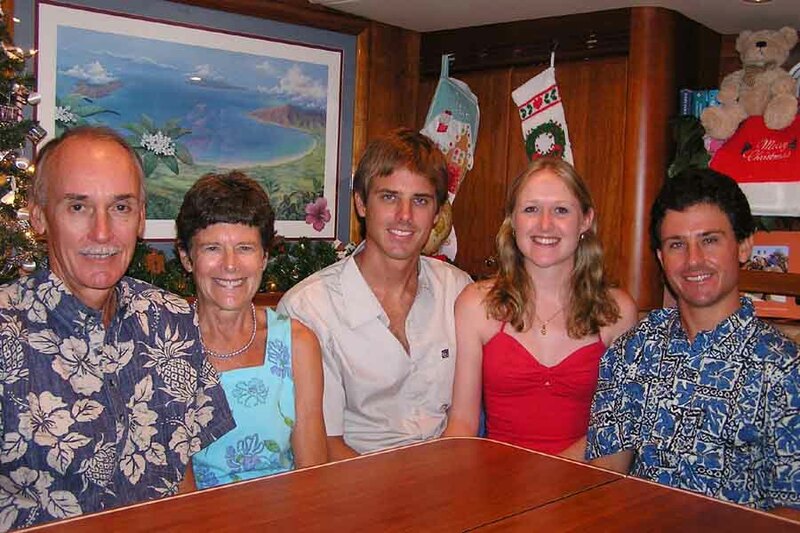 We should be in Florida by June 2006 completing our "Journey of Peace and Aloha." We consider ourselves greatly blessed to have been given the opportunity for this mission and we do hope that we have been of service to man and to God by bringing Peace and Aloha to everyone we meet along our path. We sailed about 4,000 miles during 2004, anchoring (or in marinas) at 102 different locations in five countries (Australia, Indonesia, Singapore, Malaysia and Thailand); however, the next segment will be the longest, since we are only half way around the world here in Thailand. It has taken almost six years to travel this far. We also have the most dangerous segment, about 180 miles between Somalia and Yemen, to negotiate, so we hope that you will continue to keep us in your daily prayers! We will not be mailing our Christmas letter or pictures this year, only emailing and posting them on our website:www.peaceandaloha.com. Please send your pictures and letters to our address at our daughter's home: 27138 Sunridge Drive, Evergreen, CO 80439 . We will look forward to enjoying them when we return or have mail delivered somewhere along the way. We wish you a Joyous Holiday Season with family and friends, a very Merry Christmas and a prosperous and abundant New Year of 2005! Take care and love one another. God Bless!